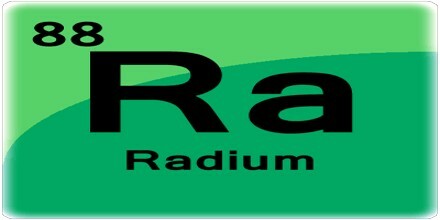 Radium is the chemical element of atomic number 88 and the element symbol is Ra, a rare radioactive metal of the alkaline earth series. It was formerly used as a source of radiation for radiotherapy. It was discovered by Marie Sklodowska Curie, a Polish chemist, and Pierre Curie, a French chemist, in 1898. 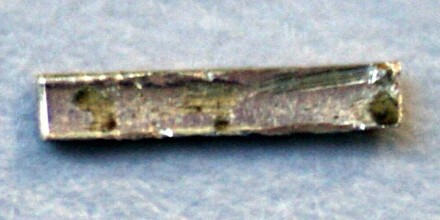 Marie Curie obtained radium from pitchblende, a material that contains uranium, after noticing that unrefined pitchblende was more radioactive than the uranium that was separated from it. Radium’s most stable isotope, radium-226, has a half-life of about 1600 years. It decays into radon-222 through alpha decay or into lead-212 by ejecting a carbon-14 nucleus. Radium is not necessary for living organisms, and adverse health effects are likely when it is incorporated into biochemical processes because of its radioactivity and chemical reactivity. Currently, other than its use in nuclear medicine, radium has no commercial applications; formerly, it was used as a radioactive source for radioluminescent devices and also in radioactive quackery for its supposed curative powers. Today, these former applications are no longer in vogue because radium’s toxicity has since become known, and less dangerous isotopes are used instead in radioluminescent devices. 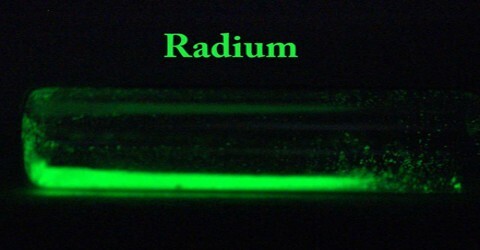 Radium had been used to make self-luminous paints for watches, aircraft instrument dials and other instrumentation, but has largely been replaced by cobalt-60, a less dangerous radioactive source. A mixture of radium and beryllium will emit neutrons and is used as a neutron source. One ton of uranium ore contains only about 0.14 grams of radium. Today, radium can be obtained as a byproduct of refining uranium and is usually sold as radium chloride (RaCl2) or radium bromide (RaBr2) and not as a pure material. 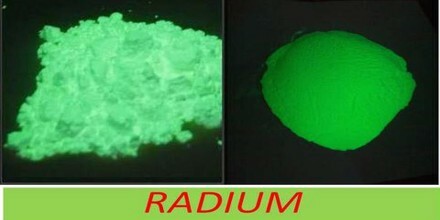 Radium is used to produce radon, a radioactive gas used to treat some types of cancer. A single gram of radium-226 will produce 0.000l milliliters of radon a day. Pure radium is a volatile silvery-white metal, although its lighter congener’s calcium, strontium, and barium have a slight yellow tint. Its color rapidly vanishes in air, yielding a black layer of radium nitride (Ra3N2). Its melting point is either 700 °C (1,292 °F) or 960 °C (1,760 °F) and its boiling point is 1,737 °C (3,159 °F). Both of these values are slightly lower than those of barium, confirming periodic trends down the group 2 elements. Like barium and the alkali metals, radium crystallizes in the body-centered cubic structure at standard temperature and pressure: the radium–radium bond distance is 514.8 picometers. Radium has a density of 5.5 g/cm3, higher than that of barium, again confirming periodic trends; the radium-barium density ratio is comparable to the radium-barium atomic mass ratio, due to the two elements’ similar crystal structures. Radium and its compounds had been industrially used since the first half of the century, in the production of glowing paints. 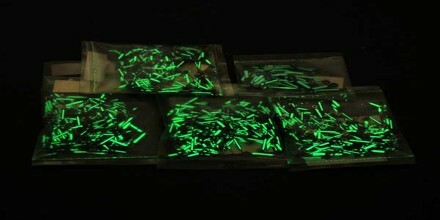 These paints glow due to the presence of inorganic phosphorus compounds, excited by alpha particles emitted by radium. The required small amount of radium is extracted from uraninite, a uranium ore with radium residues. It can also be used as neutron emitter in nuclear reactions. Can also be used in radiotherapy, due to the intense emission of gamma rays of daughter nuclei. It is an important source of radon, the heaviest rare gas. Radium salts have been used as radiation sources in the treatment of cancer but are gradually being replaced in such therapy by cobalt and cesium. Radium is used in radiation therapy for malignant diseases, particularly those that are readily accessible, such as cancer tumors of the cervix uteri, mouth, or tongue. In the form of needles it can be inserted in the cancerous tissue and left in place until its rays penetrate and destroy malignant cells. Radium can also be used in the form of plaques applied to the diseased tissue. Radium rays have been used in the treatment of eczema, psoriasis, xanthoma and other skin diseases. Radium was once an additive in products such as toothpaste, hair creams, and even food items due to its supposed curative powers. Such products soon fell out of vogue and were prohibited by authorities in many countries after it was discovered they could have serious adverse health effects. Spas featuring radium-rich water are still occasionally touted as beneficial, such as those in Misasa, Tottori, Japan. In the U.S., nasal radium irradiation was also administered to children to prevent middle-ear problems or enlarged tonsils from the late 1940s through the early 1970s.